A Palestinian released in an exchange of prisoners by Israel and Hamas reaches welcoming festivities in Gaza City on 18 October 2011. Secretary-General Ban Ki-moon today stressed the importance of averting any further deterioration in the condition of Palestinian prisoners in Israeli custody who are on hunger strike, and urged everyone concerned to reach a solution to their plight without delay. “The Secretary-General continues to follow with concern the ongoing hunger strike by Palestinian prisoners in Israeli custody, in particular those held in what is known as administrative detention,” according to information provided by his spokesperson. More than 1,000 Palestinian prisoners began an open-ended hunger strike two weeks ago, on 17 April – Palestinian Prisoners Day – to protest against unjust arrest procedures, arbitrary detention and bad prison conditions, according to the UN human rights office (OHCHR). 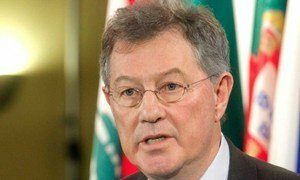 Last week, the UN Special Coordinator for the Middle East Peace Process, Robert Serry, said he was deeply troubled by reports about the critical condition of at least two Palestinians being held by Israel, who have been on hunger strike for over two months, and urged the Government to preserve the health of the prisoners. Noting that the Secretary-General urged all concerned to reach a solution without delay, his spokesperson said that Mr. Ban fully supported the efforts of Mr. Serry, who is actively engaged on this issue with the parties on the ground. A senior United Nations official said today he was deeply troubled by reports about the critical condition of at least two Palestinians being held by Israel, who have been on hunger strike for over two months, and urged the Government to preserve the health of the prisoners.